للمسافرين الذين يرغبون أن يعيشوا كل ما تقدمه المدينة، Green Island Resort هو الخيار الأمثل. إن موقعه الجيد الذي يبعد 27KM فقط عن مركز المدينة يساعد النزلاء على الاستمتاع بمعالم المدينة ونشاطاتها. سوف يعشق النزلاء موقع هذا الفندق، فهو قريب من أهم المعالم السياحية في المدينة . يعمل Green Island Resort على ضمان إقامة مريحة لضيوفه من خلال خدماته الممتازة وحسن ضيافته. لضمان راحة ضيوفه، يقدم الفندق الخدمات التالية: خدمة التنظيف يوميًا, متجر, واي فاي مجاني في جميع الغرف, متجر هدايا/تذكارات, مجهز لذوي الإحتياجات الخاصة . بالإضافة لهذا، تتضمن كل غرف الضيوف مجموعة واسعة من وسائل الراحة . بعض الغرف توفر حتى تلفزيون بشاشة مسطحة, اتصال لاسلكي بالإنترنت, غرف لغير المدخنين, مكيف هواء, تدفئة لإرضاء أكثر الضيوف تطلبًا. يمكنك الاستمتاع بالأجواء المريحة التي تقدمها كنو, تأجير معدات الرياضات المائية, الركمجة الشراعية, الغوص السطحي, حمام سباحة خارجي طوال النهار. يحظى فندق Green Island Resort بموقع ممتاز وخدمات يصعب منافستها. يرجى العلم بأن المنتجع يوفر تنقلات للنزلاء المقيمين ويتم تأكيدها عند الحجز. * مواعيد الإنزال والمغادرة قد تختلف. Had a blast with the stay. Tour guides were fun and knowledgeable, how considerate and helpful the staff were just fabulous. Jumped in and out of beach and pool, go around in swim suit around the island. Felt sorry about getting the room sandy but delight they still get so clean with every guest being like that! Didn’t get to kayak/windsurf so I was very disappointed - the wind was just too strong. Saw heaps of marine life and sea turtles and did so much snorkeling day and night. Enjoyed the island all to ourselves after 4:30 which was sooo peaceful. So many good things I want to say and definitely don’t mind staying again (only if it’s cheaper). Neither dinner nor breakfast at Emerald were good experiences. Extremely delayed for dinner, some waiters not attentive to the pace of service at tables. Breakfast scrambled eggs had a disgusting look, totally solid not good flavor, coffee dispenser needed service. Excellent arrival experience. Our bags were taken care of right from boarding the ferry to our room, really great! Really nice accomodation with friendly staff. Beautiful walks & activities. Nice when the last boat has left at 4:30pm & you have the island to yourself as many visitors do a day trip. Emerald restaurant was expensive & we had to wait an hour for our meal so missed out on our planned evening activities. Overall a great experience for us, recommended is the glass bottom boat, Jetty fish feeding, Night walk. My partner and I had the most amazing short little vacay on this stunning island! The hotel was beautiful and the staff were so welcoming and helpful! We had full use of the resort facilities for two days even though we only stayed for one night. We would definitely return! Thank you Green Island! The rating could be a perfect 5 if it weren't for accomondating the day trippers as a priority over those whom are overnight guests. 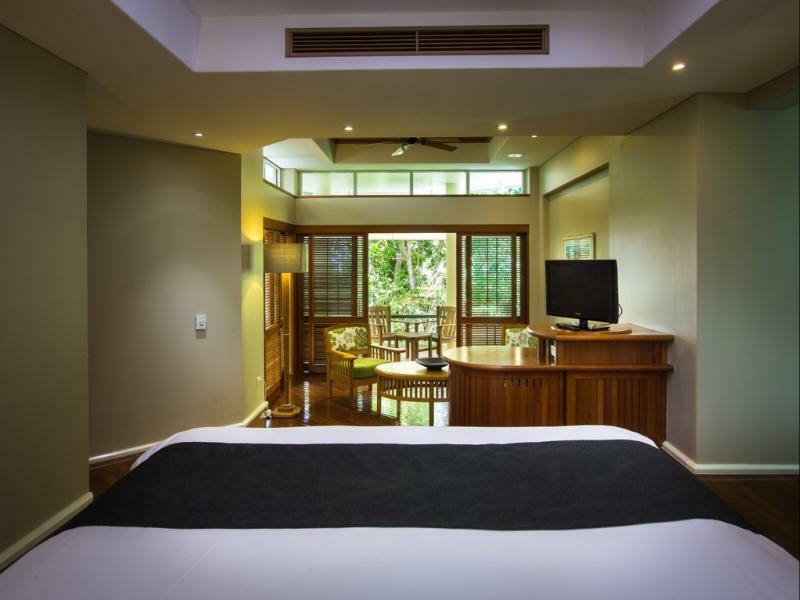 The facilities primarily there for day trippers reduces the experience of an Eco-luxury resort. The swarm of day trippers is overwhelming and frustrating and often felt like competition for food, beverages, etc. The staff was great, rooms are comfortable, the island beautiful, and location superb. You can deliver an amazing experience if you can figure out a better way to balance day trippers and overnight guests. The best would be eliminating them or greatly reducing the number of them. We loved it very much. 1 night is not enough. Great food at the restaurant and good service. So nice to do an evening walk and a glassbottom boat tour. Very beautiful. A bit busy during the day with people who come to swim. But after they have left it is very quiet. Excellent! The most wonderful piece of paradise. The Resort caters so well to day-trippers and also in-house guests. Hard to believe they can marry this up so well in such a small area. But they do! 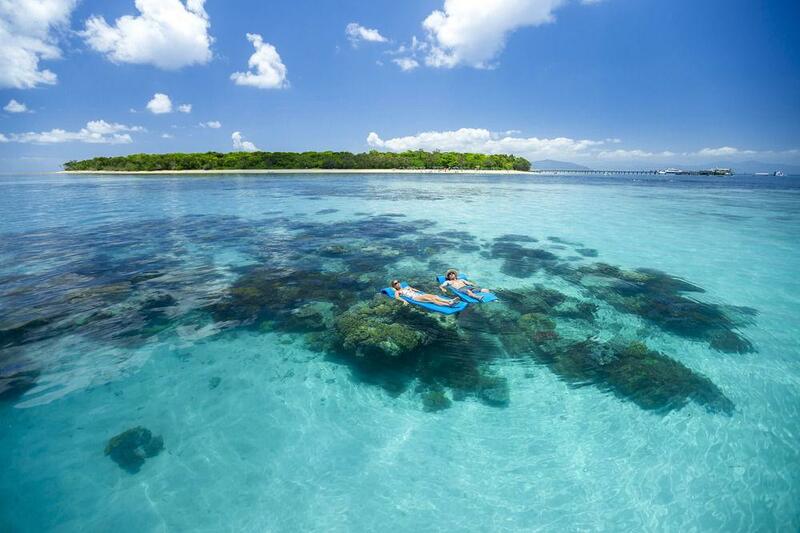 If you've not been to Green Island... then you are missing out! Amazing snorkeling right off the beach, with turtles! After 5pm it's your own private island. Great set of activities for guests. The hotel offers spacy accomodation of well furnished rooms: we felt right at home from the moment we walked in. The bathroom offers a large bath, separate shower and separate toilet. Great choice of breakfast and delicious diner menu. The staff is very friendly and helpful. They are very attentive and personally engaging. They make an effort to make you feel welcome and special. But the true beauty of the hotel is its location. Green island may be a tourist attraction by day, as soon as the last ship of the day departs the island regains its natural tranquility. Watching turtles swim about while drinking champagne at the beach with just a few other guests is quite an experience. Could have stayed there for weeks. We stayed on green island for two nights. Beautiful location, helpful and happy staff. Make sure you wait for high tide to go snorkeling around the island. Not many options for food on the island, but the restaurant is cheaper than you'd expect and the food is great. Only stayed 1 night, however wished we stayed longer. The service from the staff was excellent could not have asked for more. Enjoyed snorkelling and the fish feeding show. The food in the restaurant was amazing. Highly recommended. Return Boat tickets from Cairns, equipments for snorkeling, shower, you dont need anything if u book the hotel. Room was so clean and beautiful. Amenity was also parfect. I would like to visit again. Food was expencive though. I stayed here for 2 nights. The Green Island is a small island - to circle the island by walk will take just 1~2 hours. We saw sea turtle and ray fish from the beach. The food is great too - dinner time is very quiet, as all non-resident tourists are gone. The hotel also provides snorkeling gear and my wife and I had fun on the seashore. Suggest staying for 2 nights - no more as it will be boring, and no less as you can have time to walk along the beach and circle the island. 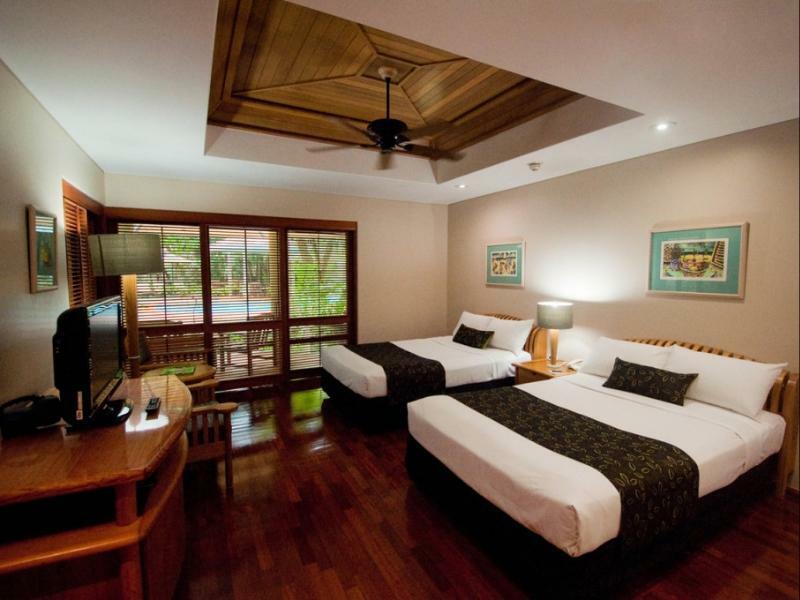 we have a wonderful stay at the green island resort. all staff were very friendly & welcoming. staff went out of their way to say hello & assist us to plan our time on the island so that we could get the most out of our stay. our room was beautiful, with a great view of the pool. restaurant food & beverages were great. overall we thoroughly enjoyed our stay, felt very relaxed & would love to return again. We arrived here on a rainy day, was quite disappointed initially as this was a lovely island with a lot of water activities (snorkeling, water skiing, etc). However, upon arrival we was nicely greeted by the hotel staff at the pier and they managed our check in process pretty well. Meals were great (a bit expensive) and they also offer complimentary drinks just before dinner time. A nice time to chat with friends and other guests staying in the hotel.